Forgive me, for I am a sinner. 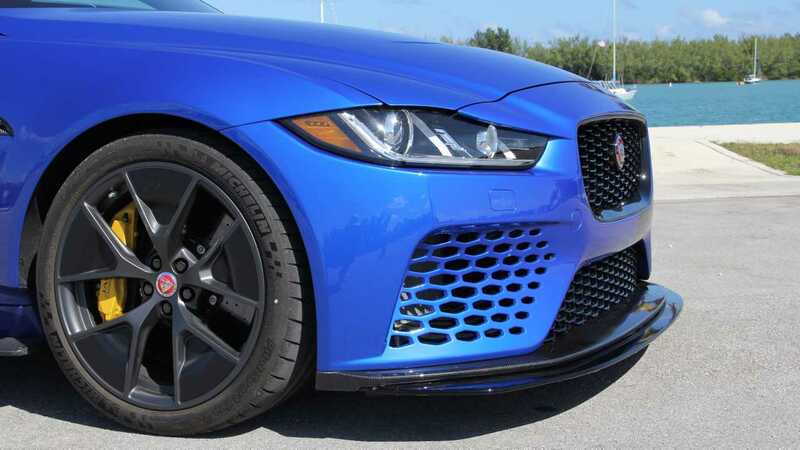 Rather than tackle the twisting tarmac of Palm Beach International Raceway or circle the banked turns of Homestead-Miami Speedway at triple-digit speeds, I putter the 2019 Jaguar XE SV Project 8 about in stop-and-go traffic and thread it around the daily congestion that plagues the freeways crisscrossing Miami-Dade County. I justify my actions by driving the Project 8 through Brickell and South Beach; wealthy areas of Miami where AMGs, Ferraris, McLarens, and Porsches dot the roads like pimples on a teenager’s face. In South Florida, racing is rarely life, but there sure is a hell of a lot of waiting around. Any Project 8 that finds its way here is more likely to compete for an open parking space than a checkered flag. The Project 8 seems willing to tolerate this fate, and the hand-assembled super sedan feels impressively robust along the pockmarked pavement that makes up A1A. There are surprisingly few squeaks and rattles from the Project 8, and the model-specific suspension changes do little to negatively impact the car’s ride quality – at least in Comfort mode. Opt for Track mode, which noticeably firms up the dampers and steering, quickens throttle response, and adjusts the limits of the stability control system, and the ride is as bone-jarring as the car’s limited suspension travel and low-profile rubber suggest. Riding on Michelin Pilot Sport Cup 2 tires wrapped around staggered 20-inch forged alloy wheels measuring 9.5 inches wide up front and 11 inches wide out back, the Project 8 offers formidable grip and benefits from predictable chassis dynamics. Every roundabout and highway onramp leaves me feeling like Jaguar Formula E driver Nelson Piquet Jr. attacking the twisting turns of Mexico’s Autódromo Hermanos Rodríguez. Additional confidence comes courtesy of the Project 8’s quick and tactile tiller that seems hardwired to the front wheels. Floor the accelerator pedal, and the steering gets lighter as weight transfers to the rear of the car. Squeeze the brake pedal to put the binders on the massive 15.7-inch front and 15.6-inch rear carbon-ceramic discs, and the steering rack adds appropriate heft as more weight moves toward the front axle. With 592-horsepower and 516 pound-feet of torque on tap courtesy of a massive supercharged 5.0-liter V8 engine, the all-wheel-drive Project 8 packs a wallop at wide-open throttle. 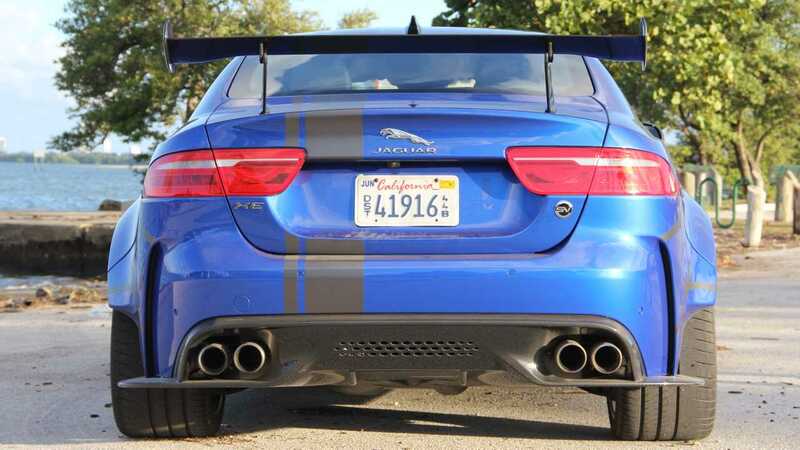 Jaguar claims the car hits 60 miles per hour in 3.3 seconds and reaches a top speed of 200 miles per hour, besting the 503-hp Mercedes-AMG C63 S sedan by 0.5 second and 20 MPH, respectively. 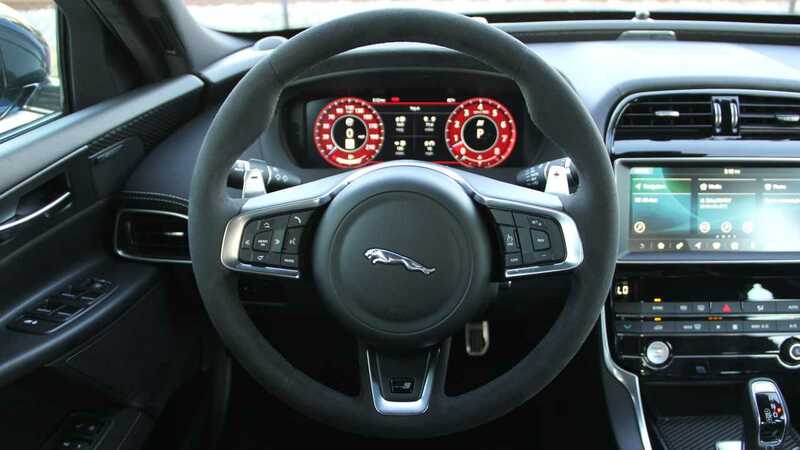 Helping maintain control of all those horses is an eight-speed automatic transmission that allows the Jag’s blown bent-eight to change personalities on a whim. At low revs, the engine sports the gentle nature of a housecat. Pin the accelerator pedal to the floorboard, though, and the powertrain packs the rage of a feral alley cat fighting for a mate. Gear shifts are rapid-fire quick, while the exhaust note from the quad pipes is appropriately sinister. A set of chunky steering-wheel-mounted paddles, as well as a joystick-like shift lever, afford manual control of the gearbox. 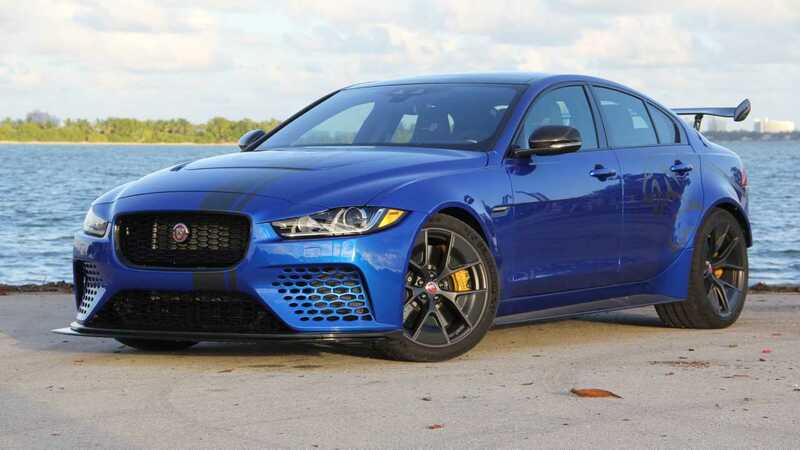 Although the flat, gridded roads of South Florida fail to capitalize on the Project 8’s handling prowess, the area’s dynamic deficiencies prove a strength when it comes time to test the sedan’s straight-line acceleration. Jetting to a given speed limit is an unadulterated rush while slaloming past slower moving traffic is as thrilling as riding the roller coasters at Busch Gardens. It’s equally as terrifying, too. 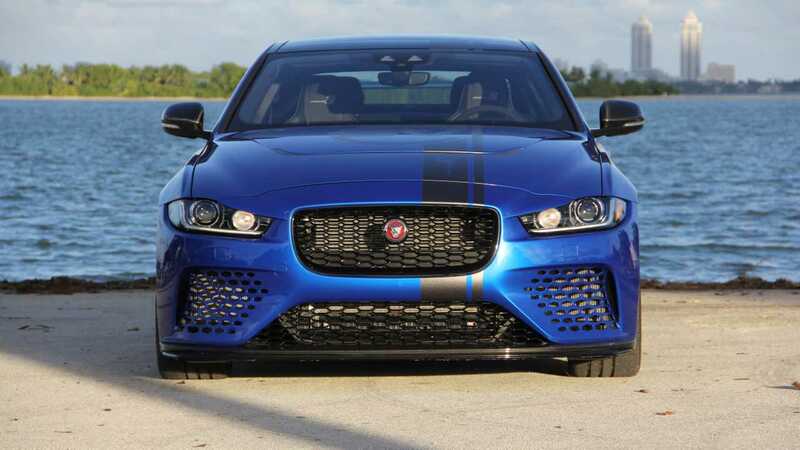 In spite of its dynamic poise and composure, the Project 8’s carbon fiber bumpers, hood, and front fenders, as well as its massive front splitter and rear wing that protrude noticeably from the body (like the car’s ride height and camber, the front splitter and rear wing are manually adjustable), make driving the sedan through heavy traffic an anxiety-ridden affair. Get in a small fender bender in a Project 8, and you’re surely left with one expensive repair bill. Get in a small fender bender in a Project 8, and you’re surely left with one expensive repair bill. The Project 8’s body panels are almost entirely bespoke, and the special XE shares only its front door skins and roof with its run-of-the-mill stablemate. 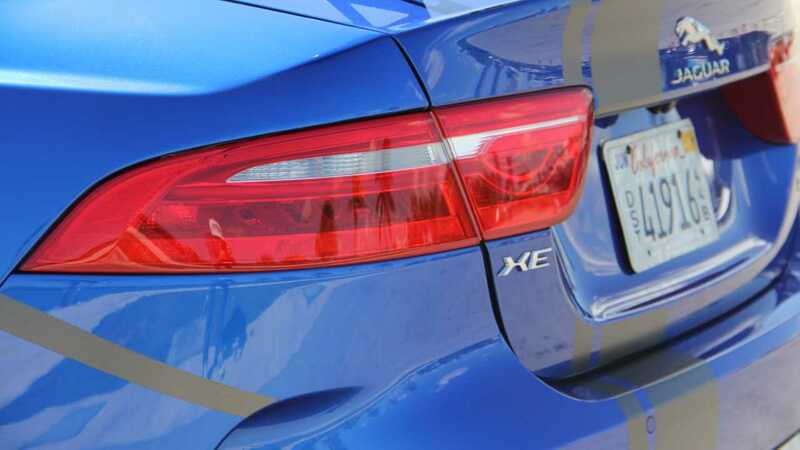 While the Project 8 simply looks like a racier XE from afar, closer inspection reveals the immense detail Jaguar put into the car’s body panels: the fenders flare out 0.6 and 2.2 inches wider at the front and rear relative to the regular XE, the front-end features chic egg-crate-like air vents punched directly into the bodywork, and the rear includes an intricate diffuser and subtle vents that emphasize the meaty rear fenders. 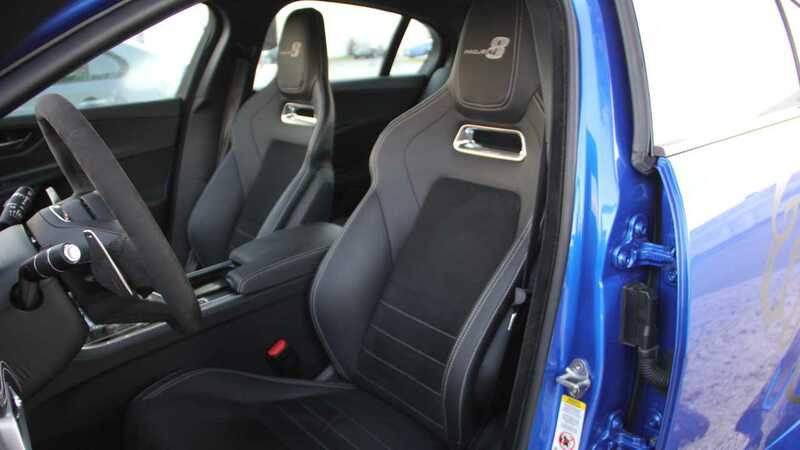 If only Jaguar poured the same attention to detail into the cabin of the Project 8, which largely mirrors that of the standard XE. Still, features such as a two-person rear bench seat, a pair of thin and cosseting magnesium-framed leather front seats with Project 8 embossed in the headrests, and a special plaque at the top of the dashboard provide occupants with small clues that the Project 8 is no ordinary XE. Meanwhile, creature comforts such as a touchscreen infotainment system, a digital gauge cluster, and a dual-zone automatic climate control system ensure the high-horsepower sports sedan offers modern luxuries for the drive to the local Cars and Coffee. That said, the Project 8 is not the sort of car one purchases for daily driving duties. With global production limited to a total of 300 units and a starting price of $187,500, or $112,900 more than the aforementioned Mercedes-AMG C63 S sedan, the Project 8 is an investment piece that is sure to appreciate with time. Although some Project 8s will surely see use on both public roads and at private track events, I predict many will languish in climate-controlled garages. What a sin.